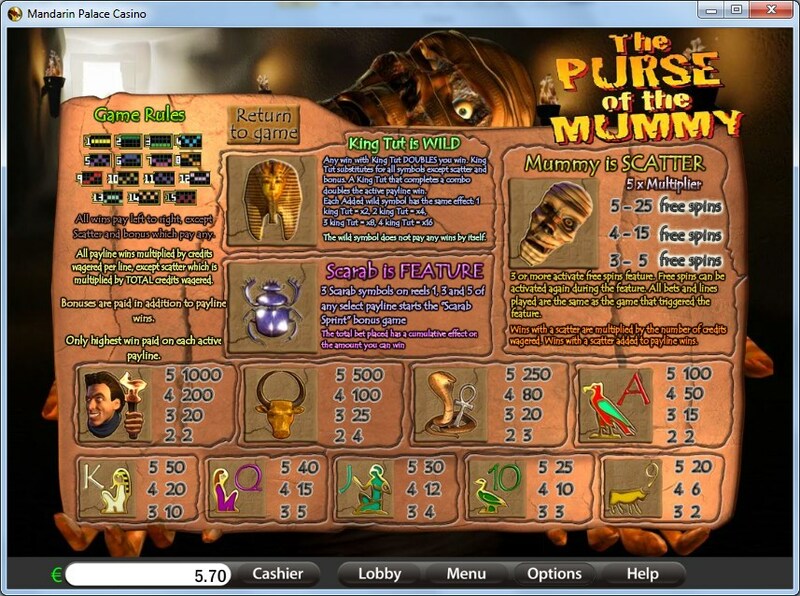 While at a first quick look you might think that The Purse of the Mummy is just another Egyptian themed slot machine, it actually seems to have an angle here, using mummies and a number of other symbols which are a lot less common in slots. The game was created by Saucify’s designers, using its slightly different theme and the collection of features as motivators. You will find only 15 paylines on the 5 reels of the game, but at least it looks better in the feature section, where you will find a bonus game, scatter symbols, 5x multipliers from the free spins, plus wilds which can also multiply prizes, by up to 16x. The top payouts normally only go up to $2,500, but that’s before any multipliers can get involved. 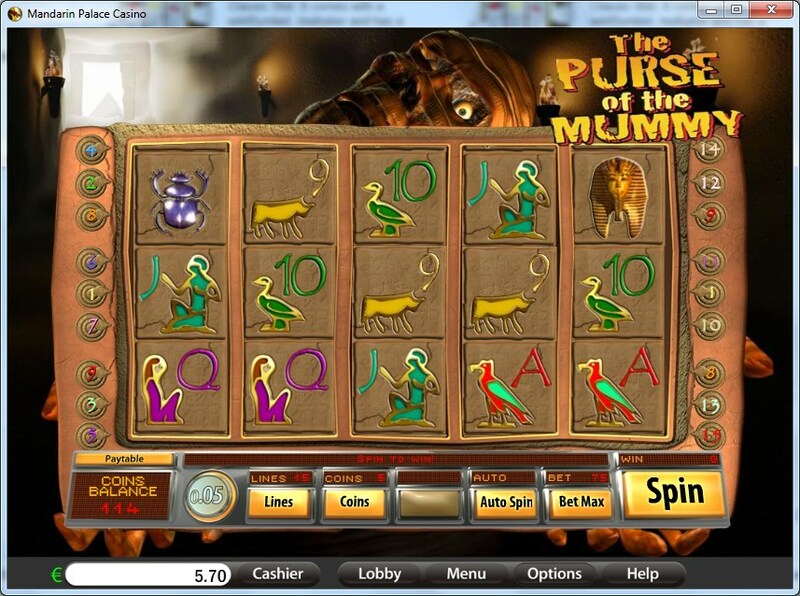 The three symbols which will help you out along the way are the Mummy (scatter with free spins), the Scarab (scatter with bonus game) and King Tut (wild with multiplier). It looks like a decent spread of features all things considered. My favorite feature of the game is the wild symbol, and that’s despite the lack of prizes from it. The reason is the multiplier that each wild will apply, instead of having the same one no matter how many wilds take part in a combo, the way most slots use it. That’s how combinations where a single wild is present are doubled in value, while two wilds apply a 4x multiplier, three wilds give you 8x the prize and four wilds will apply a total of 16x to the regular payout. If you get the Mummy icon to appear in a minimum of three scattered locations, you will get into the free spins mode, where 5 to 25 games are offered to the player. Payouts offered during these free spins get 5x multipliers, so they’re impressive as well. Even better, you can retrigger the free spins and their high multipliers. The game comes with a bonus feature, called Scarab Sprint. The Scarab scatter is the one to trigger it, with the symbol being present on the reels 1, 3 and 5 at the same time when this happens. Those are the only three reels which will have this symbol. A new screen loads up once the feature triggers, where you witness a 100m race. You pick the Scarab which you think will win the race and depending on how well it does, you get a prize out of it. You can cover each of the 15 lines with 1 to 5 coins, and they will have denominations between $0.01 and $0.50. The $2.50 line bet that you can use can turn into a $37.50 total bet. To get the best prize from the paytable, you need five symbols with the Egyptian Man on a payline. You get 1,000 coins, or up to $2,500 cash. 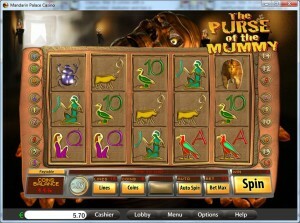 Get King Tut to help with up to four of its wild symbols, and in return you will get up to 16,000 coins, or $40,000. The design style, while somewhat different, it’s still very Egyptian looking, so there is no mistaking the game for a mummy themed title. You do see the mummy’s head at the top of the reels, and even on one of the symbols, but the overall impression stays the same. One thing I enjoyed is the use of some symbols which other slots don’t have, plus the fact that they used poker cards which look like they belong on the walls of a pyramid. Symbols: King Tut (wild), Scarab (scatter), Mummy (scatter), Egyptian Man (1,000x), Bull (500x), Cobra and Ankh (250x), Ace (100x), King (50x), Queen (40x), Jack (30x), 10 (25x) and 9 (20x). On one hand, it’s an Egyptian themed game. On the other hand, it has at least one angle to make it different than all the rest of the slots, and it also brings you great features, especially those multipliers from the wilds. All things considered, I’d say it’s worth playing. 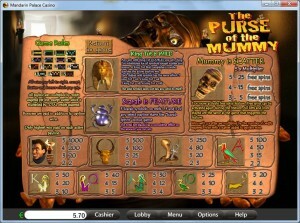 The The Purse of the Mummy slot machine is offered through the Saucify/BetOnSoft platform, so if you want to play it for real or just to practice, look out for casinos that use it.